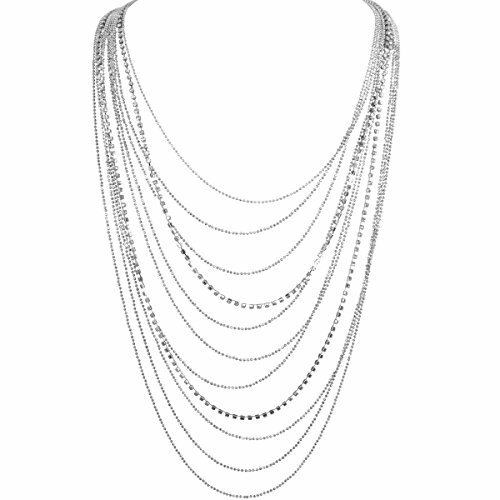 This long, cubic zirconia crystal-embellished layering necklace is striking yet versatile. Its slim layered chains are adorned with cascading metallic beading and tiny pave jewels. The glamorous multi-chain design perfect complements any day-to-night, party, wedding, or special occasion look. Approximate measurements: 33 inch with 3 inch chain extension. Adjustable lobster clasp closure. ELEGANT & STYLISH DESIGN - This multi-layer statement necklace features cascading strands of sparkly simulated diamonds. SUPERIOR QUALITY - Approximate Measurements: 33 inch with 3 inch extension. Cubic zirconia and high-shine plated base metal. To extend the life of your high quality costume jewelry, limit exposure to water, perfume or body cream. This item may not be suitable for people with metal allergies. Due to monitor differences, colors online may vary slightly from their appearance in person. CUSTOMER SATISFACTION GUARANTEED - Questions or concerns? No worries, all Humble Chic NY products are fulfilled by Amazon and eligible for 100% free returns for 30 days with no questions asked. Enjoy a RISK FREE purchase today. AUTHENTIC BRANDED ITEM - Humble Chic NY is an American owned and operated company based in New York City, and the only authorized seller of this original product. Beware of inferior imitations. THE ULTIMATE GIFT - Hand packaged with love in the USA in a signature Humble Chic gift box. The perfect present for yourself, birthdays, anniversaries, mom, and more. Search or click on "Humble Chic NY" to see our complete collection on Amazon. If you have any questions about this product by Humble Chic NY, contact us by completing and submitting the form below. If you are looking for a specif part number, please include it with your message.